Over the past few decades, rates of gluten intolerance, also known as celiac disease, have skyrocketed. Today, it is estimated that nearly one out of every 133 people may have some degree of gluten intolerance. Whether this is because of a rise in actual gluten intolerance or just better ways of understanding and diagnosing the disease has yet to be determined, but it does mean that more and more colleges are paying attention and providing for the needs of students who may suffer from a gluten intolerance. While there is still a long way to go in making the majority of schools safe and celiac-friendly, some colleges and universities are going above and beyond when it comes to providing gluten-free options. Here are just a few of the schools who are leading the way, though many, if not most, have programs to provide meals for students with any kind of dietary need. At Baylor University, students can find a wide range of gluten-free menu options through the school’s dining services. Due to demand from students, the university began offering more gluten-free options in 2010, and students can find out about which dining halls and menu items will meet their needs through the menus posted online each week. Students with gluten intolerance can get help through a student nutrition coordinator found on campus. These professionals can help to ensure that students get the nutrition they need without encountering any potentially harmful gluten. Additionally, Volunteer Dining offers a range of gluten-free options both in residential dining halls and in the stores found throughout the campus. For students who still can’t find what they need, the school offers the option to put in special orders, though this must be done ahead of time. Georgetown University is working hard to meet the dietary needs of all the students on campus. While dining halls do not always have gluten-free options, students shouldn’t despair. The school has a registered dietician on staff who can help those with celiac to find the resources, tools, and food they need. This program can provide students with everything from gluten-free foods, to a gluten-free microwave to use, so that they’ll stay safe and healthy on campus. Students at Oregon State don’t have to work hard to find gluten-free options in their dining halls. The school offers a list of all of the gluten-free options they serve in each on-campus dining hall or cafe. At some locations, these options may be limited, but in many of the larger dining halls, gluten-intolerant students should find a wide range of healthy and tasty foods that won’t irritate their digestive systems. If those items don’t suit student needs, there is always a registered dietician on hand to make sure that dietary considerations are met. Bard College offers dining hall services that can meet a wide range of student dietary needs, from veganism to gluten intolerance. The school is currently working on renovations to one of their main dining halls that will include a new gluten-free section, keeping these foods separate from those that might contaminate them with gluten and cause reactions in some of the most sensitive students. In addition to a thriving student club on campus advocating for gluten-free options, UW Madison is working hard to meet the needs of students who need meals that are vegetarian, vegan, or gluten-free. They’ve begun to label all food served in the cafeteria with symbols that are designed to make it simple to determine whether an item is OK to eat. Students can check with the weekly menus posted online to see what options will be gluten-free on any given day, with great choices like Thai noodles with tofu, tostadas, and enchiladas available. Eating gluten-free on campus can be a challenge, but Southern Methodist works to ensure that the process is a little bit easier for students. There is a registered dietician on staff who can help to design a healthy eating program for students and provides gluten-free options and equipment to students. Additionally, the school has recently created a dining hall called Healthy on the Hilltop which serves vegan and gluten-free fare (among other healthy options) to students with these dietary restrictions. Many people don’t realize the seriousness of gluten intolerance and how it is different from a food allergy, but students at the University of Arizona are working to change that. They have a large and growing group of advocates on campus who are pushing for greater gluten-free awareness. Dining services has taken notice, and in the fall of 2011 it began making changes to make it easier for gluten-free students on campus. This included switching to gluten-free food suppliers, choosing local foods, and educating staff on gluten-free preparation. Additionally, the school now offers several gluten-free entrées on campus, including pastas and breads that are totally gluten-free. There are three dining halls on Ithaca College’s campus, and each offers varying levels of gluten-free accommodation. At the main dining hall in the student center, there are gluten-free menus available for both lunch and dinner every day, giving students a range of options to choose from. There is also the Gluten-Free Pantry, which provides gluten-free breads, pastas, and equipment like microwaves and toasters. The other two dining halls don’t have a running menu, but students can pre-order gluten-free meals at them by contacting the dining hall management. Students at Texas A&M in Corpus Christi will find help from the school’s registered dietician in finding healthy and safe meal options. In the dining halls, students are provided with products like rice cereal, gluten-free pizza, soups, snacks, and desserts, as well as a whole host of veggies. In order to make eating in the dining halls less complicated for students who need to stick to a gluten-free diet, Notre Dame has listed all the menu items they serve on campus that are free of gluten. Students can search by dining hall for entrées, sides, and snacks that are gluten-free. For students who want something different, the dining hall will prepare special meals on request to meet any dietary needs, including gluten-free. Students can follow this link to an informative guide on eating gluten-free at UNH. With the help of the registered dietician and the director of culinary services, students shouldn’t have too hard a time finding gluten-free options. In each of the three dining halls on campus, students can find a gluten-free zone with restricted microwaves, toasters, and refrigerators, as well as a selection of prepackaged gluten-free items like cereal, bread, granola bars, waffles, desserts, and condiments. Students can also choose to pre-order meals or cook their own stir fry or omelets in separate gluten-restricted stations. SUNY Potsdam goes above and beyond when it comes to accommodating students who need to eat gluten-free. Students at SUNY can choose from a wide range of gluten-free prepackaged items for entrées or snacks. There are also separate stations in the dining halls that cater to gluten-free eaters, preventing cross-contamination while also ensuring celiac students have plenty of options to choose from. Even at the school’s deli, students can choose from a variety of gluten-free breads, making finding something to eat on campus much easier. Additionally, meals can be prepared on request for any student who needs or wants them. Tufts takes food allergies and intolerance quite seriously, and has tried to accommodate students with these special needs accordingly. The school has prepared a number of educational pamphlets on the issue that students can read through to learn what their dining options are on campus and how gluten-free meals are prepared. Students are advised to work with the school’s dietician, but can also find information on all menu items through “food fact cards.” The school also lists all foods served at dining halls across campus that are safe for celiacs to eat. This entry was posted in Culture, Health, Labeling, Politics and tagged Best Colleges Online, celiac in school, diagnosis, gluten free schools, gluten free university on January 18, 2012 by glutenfreepdx. A nicely informative article from the Daily Astorian via the Eastern Oregonian. 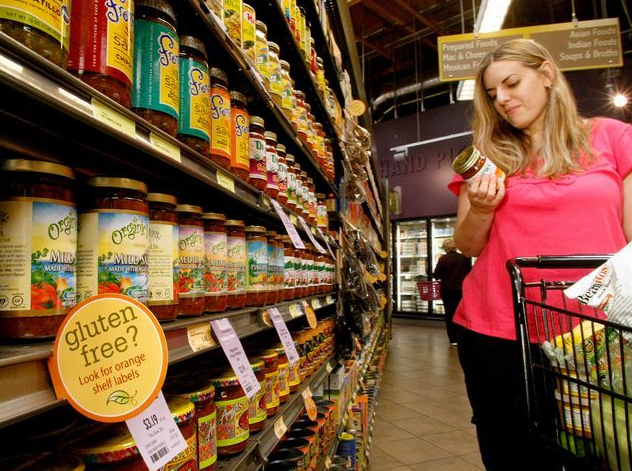 “Gluten-free” foods are available in supermarkets more than ever before, thanks to increasing awareness of celiac disease. In the United States, about one out of every 130 people has celiac disease – an autoimmune disorder triggered by the consumption of gluten. Gluten is the protein part of wheat, rye, barley and triticale. When someone with celiac disease eats anything containing gluten, the immune system reacts abnormally because it identifies gluten as a foreign substance. This reaction causes inflammation and damage to the small intestine, and interferes with the absorption of nutrients. Celiac disease is not an allergy to gluten – people can grow out of allergies. Rather, it’s an autoimmune disease that you can’t grow out of. It can appear at any time in a person’s life, and may be triggered by surgery, a viral infection, severe emotional stress, pregnancy or childbirth. For many people with celiac disease, the time between the onset of the symptoms and diagnosis may be long. Celiac disease is commonly misdiagnosed as irritable bowel syndrome, gastric ulcer, Crohn’s disease or a parasite infection. Typical symptoms of celiac disease include ongoing diarrhea or constipation or both, bloating and abdominal discomfort. Celiac disease should be suspected in children with stunted growth, pale appearance, irritability, potbelly, flat buttocks and/or foul-smelling stools. Other symptoms of celiac disease include iron deficiency anemia, irritability, depression, fatigue, weight loss, canker sores in the mouth, joint pain, muscle cramps, and tingling in the hands and feet. Many of these problems result from vitamin and mineral deficiencies, because nutrients are not well-absorbed in the small intestine. Some people with celiac disease have a blistering, intensely itchy skin rash – most often seen on the elbows, knees and buttocks – called dermatitis herpetiformis. This rash, with small clusters of red bumps, may or may not be associated with intestinal symptoms, but the treatment is the same. The risk factors for celiac disease include a family history of celiac disease, autoimmune diseases such as diabetes and thyroiditis, and some genetic problems such as Downs syndrome and Turner syndrome. To diagnose celiac disease, the first step is a blood test, looking for specific antibodies. If the antibody tests are positive, the next step is an endoscopic small bowel biopsy to confirm the diagnosis and assess the damage in the lining of the small intestine. Once the diagnosis of celiac disease is made, the treatment is straightforward: complete exclusion of gluten from the diet. People living with celiac disease must completely avoid wheat – including farina, graham flour, durum, semolina, einkorn, Kamut, spelt, matzo meal and farro – rye and barley. There are no medications for celiac disease. Once people with newly-diagnosed celiac disease start a gluten-free diet, they start feeling better within days. Although the treatment is straightforward, it is not easy to stick to a gluten-free diet. Gluten is used as a protein filler in products such as sausage, soup, gravy, soy sauce and ice cream. Pizza, croutons, crackers, pasta, bread, most cereal, cookies, cakes and pies are all off-limits. Gluten is also used as a binder in some pharmaceutical products. It’s not a matter of just decreasing the amount of gluten in the diet – it must be completely eliminated. Even trace amounts of gluten can cause intestinal damage in people with celiac disease. Possible long-term complications of celiac disease include infertility, increased risk of miscarriage, osteoporosis, intestinal lymphoma and bowel cancer. Some with celiac disease also become lactose intolerant, meaning they can’t digest the milk sugar found in dairy products. Amaranth, buckwheat and quinoa are gluten-free grains, but they can be contaminated with gluten-containing grains during harvesting and processing. Flours made from rice, soy, potato and corn are gluten-free. Oats are gluten-free, but there is some controversy about whether or not they are safe. Oats are likely to be contaminated with wheat, and some people with celiac disease and dermatitis herpetiformis also react to a substance in oats. Be sure to look for “gluten free” labels. People living with celiac disease must learn to read food labels to look for gluten-containing ingredients. It’s a challenge to stick to a gluten-free diet when eating out. Try to find restaurants that understand your need to avoid gluten, get to know the staff and patronize them often. If you have celiac disease, reach out and connect with others in your area and talk to grocery stores and restaurant owners about the importance of having gluten-free options available. Kathryn B. Brown worked as a registered nurse and a nurse practitioner before going to work for the East Oregonian. She can be reached at kbbrown@eastoregonian.com. This entry was posted in Culture, Health, Science and tagged Celiac Disease, diagnosis, diet, Eastern Oregon, FAQ, FAQs, food, Health, Oregon, Oregonian, what is celiac?, what is gluten-free? on April 8, 2009 by glutenfreepdx.